The Supreme Google Webfonts adds Google webfonts into a nice dropdown list in your visual editor which you can use to change your font type and/or font size. 2. Click on Toolbar Toogle to reveal the advanced formatting toolbar to view your additional font options. 4. Highlight the text you want to change. 5. Select the font type from the Font Family drop down menu. 6. Select the Front size from the drop down menu. By default, you’ll see 26 Google Webfonts in the font family dropdown list in your visual editor. 1. Go To Settings > Writing. 2. 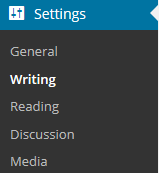 Select the fonts you want to add and then click Save Changes. It’s best to only select fonts you intend to use, and limit the number you select, because enabling lots of additional fonts will slow down loading of your blog.